The estimated crowd of 5000 world travellers sat with cameras ready and everything from hope to hoax written on their faces. They sat on the grass or stood in groups as they waited. The time was ticking toward the 4:00 pm ‘beginning’. With the clouds hiding the sun, some of the people started to wander to explore the Jaguar Temple and ball court, but kept peeking behind the corners of the Mayan architecture to check on the status of El Castillo, the Castle, also known as the Temple of Kukulkan. For today it is September 21st, the autumnal equinox, when the lengths of daylight and night time hours are equal, hence the name ‘aequus/nox’ or day/night. Between the hours of 4:00 and 5:00 pm, the rays of the sun will, if we are lucky, hit the Temple of Kukulkan and turn the dark triangles on the side into forums of light as they travel down the pyramid toward the head of feathered serpent at the base of the staircase (the Kukulkan) and create an image of a slithering serpent. It’s an Indiana Jones moment-in-waiting. Just as the movie character in the movie “Indiana Jones and The Lost Ark” held a crystal aloft to allow the sun’s rays to pass through and point a beam of light on the location of the lost city of Tanis and the Well of Souls in which the ark might exist, everyone at Chichen Itza is waiting for something spectacular to happen. But let’s back up a bit. We had arrived that morning at Cancun airport in Mexico’s Yucatan (pronounced Ju-ka-tàn) peninsula and after checking in to our hotel to freshen up, we set off for Chichen Itza. In the Maya language, Chichen Itza meant, literally, “at the mouth of the well of the Itza”. “Itza” referred to a group of people who may have been known as the enchanters or sorcerers of the water. And the ‘well’ or water refers to one of the cenotes that defined the area and allowed settlement to take place. A cenote is a sinkhole resulting from the collapse of the limestone bedrock and exposes the ground water. It is analogous to a cave that has partially collapsed. The roof of the cave still exists but it is for all intents and purposes, protecting the pool of crystal clear water underneath. And this would have been a source of water for the Maya. The drive from Cancun (another Maya word often translated as “nest of snakes”) to the town of Piste is roughly three hours. We stopped for a traditional Mexican lunch at the Pueblo Maya Restaurante before continuing on for about 5 minutes to Chichen Itza. And the crowds were out in full force: at the entrance, in the souvenir and book stores, buying cold drinks and cold Mexican beer, and heading down the shopping-stall-lined pathway to El Castillo. Vendors were selling hats, T-shirts, masks and wood carvings, as well as demonstrating the Jaguar call, a small whistle-like object that, when blown with energy and gusto, sounds like a Jaguar is right behind you and ready to pounce. 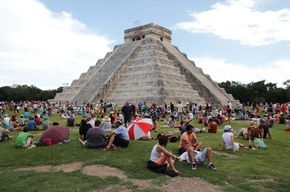 On the grassy square in front of the Temple of Kukulkan were an estimated 5000 people waiting for something to happen. When I first visited Chichen Itza in 1985, the popular thing to do was climb to the top of the 24 meter high structure (72 feet) using a chain to haul yourself to the top as well as to prevent you from tumbling down the narrow steps on the way down, as you descended backwards. In 2006 the government put a stop to the climbing in order to better preserve the Temple, constructed between the 9th and 12th centuries, as well as in consideration to the health and safety of visitors negotiating the 91 steps on each of the four sides of the pyramid-shaped Temple (thereby symbolizing the 364 days of the year (91 X 4)). Kukulkan is the name of the Mayan snake deity; hence the giant snake head at the base of the Temple. Nearby are other imposing structures, reflecting not only the fascination of the Maya with celestial calculations but also their earnestness in pleasing the gods. There is the Temple of the Jaguar, the Temple of the Warriors, the Temple of the Thousand Columns, the Observatory, and more. It is no wonder that Chichen Itza is one of the most popular attractions not only in the Yucatan but in all of Mexico. 4:00 pm came and passed, and still the heavy clouds seemed to be deliberately hiding the sun from us. Every time there was a gasp as the lining of the clouds grew brighter, indicating a possible burst of light, there was another cloud quickly rushing over to add another layer to hide the sun. We wandered the grounds while watching the sky for some breakthrough. The guards were closing off all the temple areas in deference to the usual 4:30 pm closing of the site, and concentrating everyone in the square before the great pyramid, which would stay open today until 6:00 pm. The vendors were having a field day as people bought their own version of sacred relics as keepsakes of the special pilgrimage on this unique day. Every vendor was offering discounts, sort of. When a friend bought a red, wooden skeleton (one of the Day of the Dead decorations) for 100 pesos (about $10.00 US), I stood ready to purchase one afterward but my special price was 500 pesos. When I reminded the cheery vendor of my friend’s ‘special price”, he relented and offered me the piece for 200 pesos. We had a very friendly chat for several minutes, and finally I was allowed the same pricing. Everywhere, the vendors were personable and chatty. One man called out as I walked by his deserted stall, “please come over to look so I can rip you off”. He was laughing, I was laughing and we had a nice talk for a few minutes. 5:00 pm and the crowds started to head back to the parking lot. Their Indiana Jones moment had not arrived. The sun stayed behind the clouds; the illuminated snake did not make its way from the top of the pyramid to the giant snake head, the Kukulkan, at the base. There was a momentary panic as the sun actually started to emerge, but then climbed back behind yet another cloud. Even the sun had a sense of humour today. But you know, I did not hear one word of complaint or disappointment from anyone in the crowd or in our small group of nine Canadians. Sharing in the celebration of the autumnal equinox was the important experience for all of us and having a chance to witness the mystical structures at Chichen Itza was reward enough. With the end of the great cycle of the Mayan Calendar occurring on December 21st, 2012, the crowds will, no doubt, gather at Chichen Itza once again to participate in the monumental event. If it does not actually change the world, it will, as it always does, change the perception of the visitors about the history, traditions, mysticism, and beliefs of the Maya and Mexico.